Ménière's disease: ‘a riddle wrapped in a mystery inside an enigma’. Has the key been found? Jonathan Fishman, Edward Fisher, Musheer Hussain, The Journal of Laryngology & Otology, Volume 132 Supplement 9, pp 763-763. C Peled, M Kraus, D Kaplan, The Journal of Laryngology & Otology, Volume 132 Supplement 9, pp 775-779. J Hornibrook, The Journal of Laryngology & Otology, Volume 132 Supplement 9, pp 771-774. N H Davidoss, R Eikelboom, P L Friedland, P L Santa Maria, The Journal of Laryngology & Otology, Volume 132 Supplement 9, pp 764-770. Y Abbas, G Smith, A Trinidade, The Journal of Laryngology & Otology, Volume 132 Supplement 9, pp 786-789. K Mahawerawat, P Kasemsiri, The Journal of Laryngology & Otology, Volume 132 Supplement 9, pp 827-831. 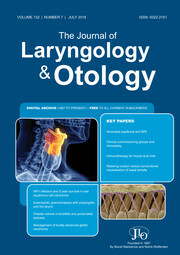 B Karabulut, İ Deveci, M Sürmeli, A Şahin-Yilmaz, Ç Oysu, The Journal of Laryngology & Otology, Volume 132 Supplement 9, pp 832-836. O Çakır, G Berkiten, B Tutar, A B Yılmazer, T L Kumral, Z Saltürk, Y Uyar, The Journal of Laryngology & Otology, Volume 132 Supplement 9, pp 796-801. M Wróbel, P Sobolewski, G Greczka, W Gawęcki, The Journal of Laryngology & Otology, Volume 132 Supplement 9, pp 802-806. N Siupsinskiene, I Katutiene, V Jonikiene, D Janciauskas, S Vaitkus, The Journal of Laryngology & Otology, Volume 132 Supplement 9, pp 816-821. Reporting in stapes surgery: are we following the guidelines?